The way promoted listings work has been re-thought and rewritten from scratch in v1.7. We’ll explain how it all works, step by step. You can enable Promotions in WP Admin -> Theme Tools -> Integrations. By default, the new Promotions version will be activated. You can also roll back to the previous version of the feature, if you’ve been using it and don’t want to move away from it, although that’s not recommended. Promotion Packages can now be created as WooCommerce Products. In WP Admin > Products, click Add New. Give a name to the product, such as “Premium Promotion”, and under “Product Data” select “Promotion Package”. 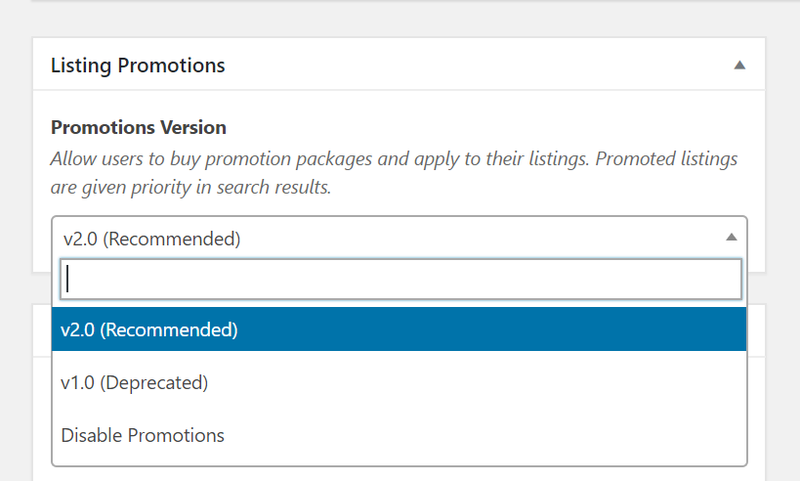 You should now see additional promotion related settings. 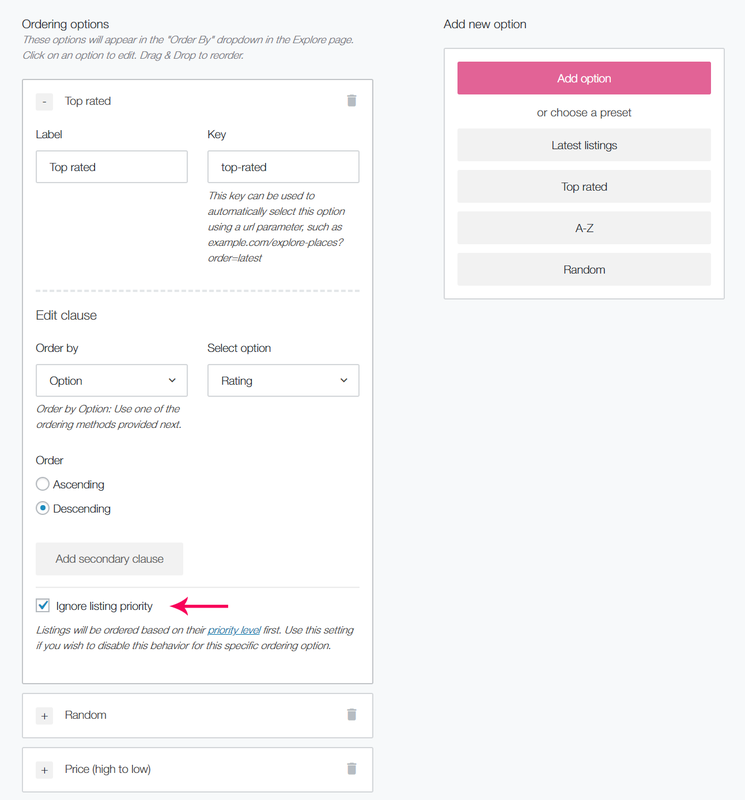 Set a price, promotion duration, promotion priority, and click Publish. Promotion Duration: Number of days the listing will be promoted from the moment the payment and order is completed. After this, the listing will automatically revert back to it’s old priority settings. Promotion Priority: A numeric value for the priority that will be given to listings with this package. Higher value means higher priority in search results. The recommended value is 2, but you can have more expensive packages that give an even higher priority. You can create multiple promotion packages, with difference pricing, duration, and priority. They will be displayed to users ordered by price, from lowest to highest price. 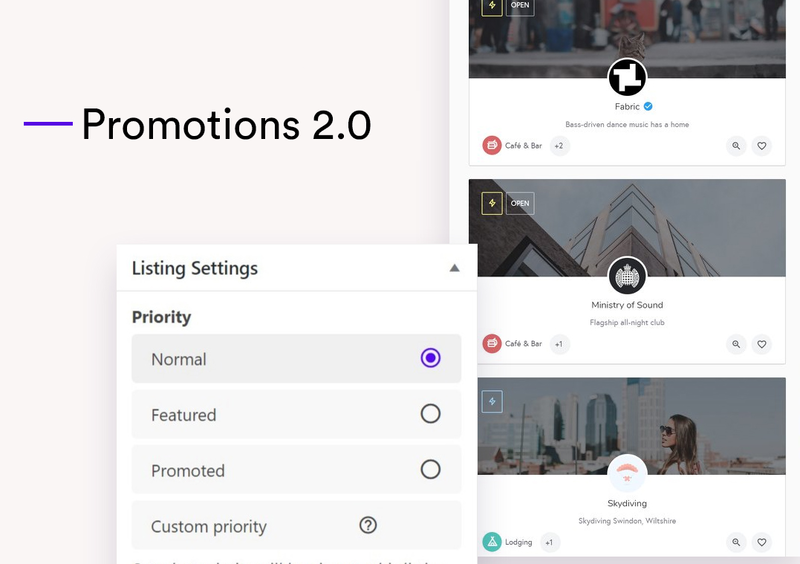 Once you have setup promotions following the steps above, a new “Promote” button will appear under each listing in User Dashboard > My Listings. Clicking on it will open a pop-up with the list of promotion packages the user can choose from. After the user decides which one to buy, they can click on the package, and will be redirected immediately to the Checkout page. Once the order is placed, verified, and completed, the listing will be automatically promoted and given the higher priority in search results. It’s also worth mentioning that if the user buys a promotion package directly from the Shop page, they will appear in the pop-up too, under the “Owned Packages” label. Those can be used then immediately to promote the listing, as the order has already been completed. 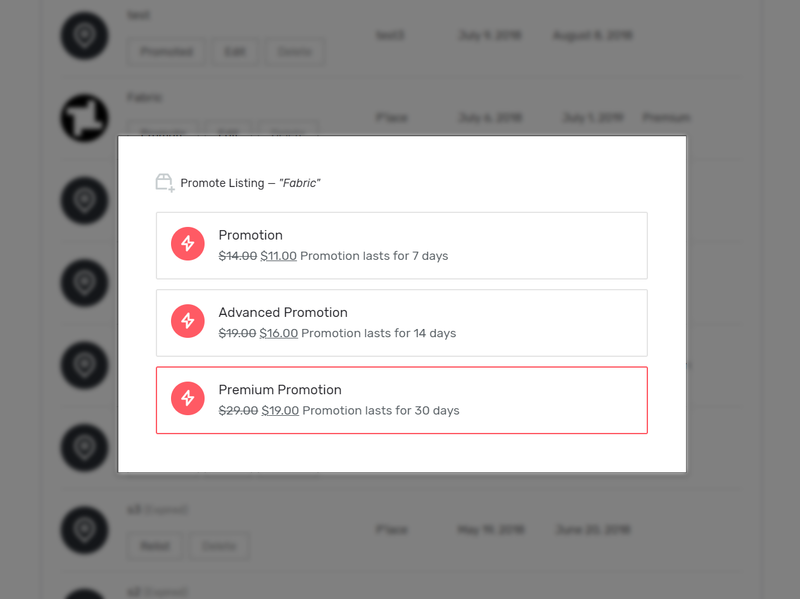 Active promotions can be managed by users in User Dashboard > Promotions. All user promotions can be seen in WP Admin -> Users -> Promotion Packages. When a listing is promoted, a new item is added in this page, with the listing, product, order, duration, and user information. You can also manually create promotions in this page, by clicking on “Promote a Listing” at the top of the page. In this case, only the listing and duration fields need to be filled. These manual packages won’t be visible in the front-end of the site, to the users that own those listings. In addition to promotion packages, the site owner can also manually set the listing priority. This will override the priority set by promotion packages, if the listing has any. This can be done through WP Admin -> Listings -> Edit Listing. In the right sidebar area, there’s a new “Listing Priority” section. Search results in Explore page will be ordered by priority first, then by other ordering clauses. 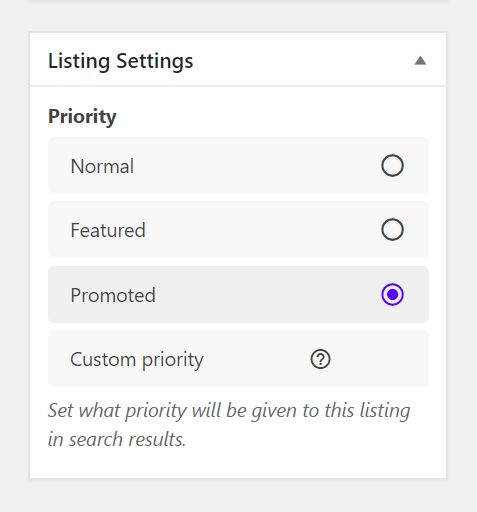 Promoted listings have the highest priority, then Featured listings, and finally listings without any priority set are shown. There are some cases when you may want to ignore listing priority when displaying search results, for example if you want to show listings based on rating. This is made possible by a new setting in the Listing Type Editor. Go to Search Forms -> Listing Order, click on an option, and at the bottom you can check “Ignore listing priority”. Promoted and Featured listings will appear at the top of search results, and they are now always relevant to the active search query/filters. 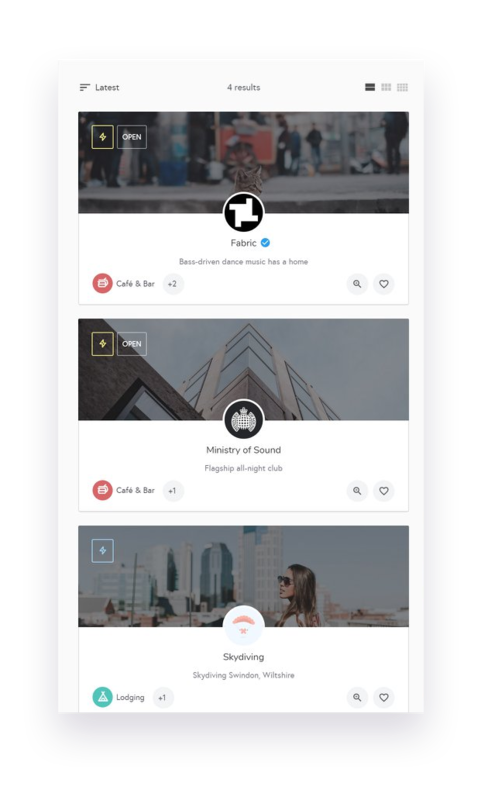 Based on level of priority, listings will either have a gold badge (promoted listings), or a blue one (featured listings). Hi guys, I’ve just followed the above steps and doesn’t seem to be generating the promotions key product in WC. Any ideas? Go to yoursite/wp-admin/options.php, and look for the “case27_promotion_product_id” option. Set it’s value to empty and click save. Now go to Listing Tools > Integrations, configure you’re promotion keys, and save changes. This will recreate the product in WooCommerce. When i applied a Promotionnal key to a Listing. Where this promotion show up on the frontend ?